Microsoft's Stephen McGill has insisted that 2011 will be the Xbox 360's year of the Kinect. The Xbox chief believes that, despite a 'brilliant' line up of games for the 360, it will be the motion controller Kinect add-on that defines 2011. 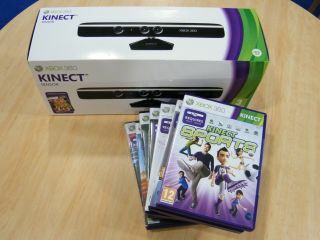 "As for the future, we've got a brilliant line-up for 2011 but it's ultimately all about Kinect," McGill told CVG.
" Kinect is going to blow people's minds. They're [already] buying it, but we've got a line-up of Kinect games that will blow people away." Microsoft was aiming to sell 5 million Kinects by the end of 2011, with reviewers conceding that several underwhelming launch titles did not detract too heavily from the potential of the device. TechRadar'sKinect reviewsuggested that the Kinect was turning the Xbox 360 into a much more rounded console. Many major developers will unleash their offerings for the Kinect next year, and hopes are high that the motion and voice controller will begin to show just why Microsoft is so excited about the device.